I’ve never eaten a single bite of Spam in my life, yet I probably have more goofy stories surrounding the iconic slab of preserved, pork product than most people living outside of Hawaii or Guam. I’m hardly what you’d call a super-fan of the wartime staple. I don’t go to canned ham or potted meat conventions, and I don’t dress up in a specially-constructed costume of my own design trying to meet up with other enthusiasts obsessed with chopped-and-formed foodstuffs. I don’t write Spam slash fiction. 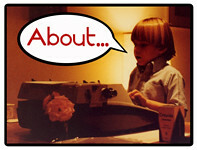 I was just a weird kid who, back in the early 1990s, took a joke just a little too far. Five years too far. I’m sure most people hate high school, and I’m no different. I’ve got a few scars, but I was lucky enough to find an anti-clique that got me through mostly unnoticed. I was part of a group of four kids who loved comic books and role playing, who were smart enough to avoid getting into fights and just dumb enough to not care all that much about what anyone else thought. We were those kids who took any available art class and managed to avoid every single pep rally. We were basically invisible. This can have a strangely unexpected effect on a kid. It made me yearn to be noticed, even as I did my best to hide. I was that guy who sweated bullets while trying to talk in speech class, the one who lived in fear of getting called on by a teacher, the one who walked the long way around the gym to avoid getting catcalls from the cool crowd at the smoking area. My outlet came after a late-bloomer’s introduction to Monty Python in the 10th grade. 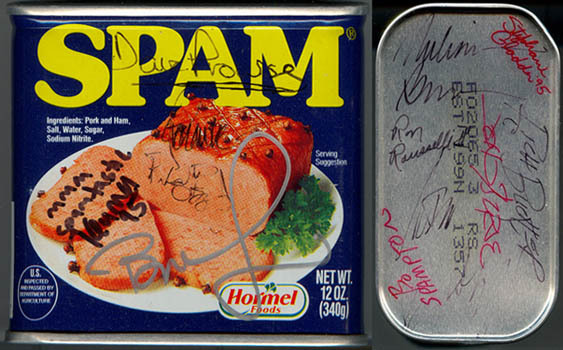 There was something completely enchanting about the absurd use of the iconic meat treat in the Spam sketch, as well as the throw-away line during the approach-to-Camelot song in Monty Python and the Holy Grail. My tiny cadre of friends and I made Spam jokes for weeks. It got to the point where the word lost all meaning for a while and eventually it became a generic stand-in, a variable for in-joke comedy. After that first month my friends got sick of it and moved on. I took it further. I bought my first seven-ounce can of Spam with the leftovers from my weekly comic book allowance. The plan was to wear it around my neck to school the next day. I carefully wove together a handful of homemade friendship bracelets, fashioned them into a sturdy necklace, and strung them through the pull tab on the top of the can. I made sure to put a few dollops of superglue onto the tab to keep it from lifting open. The last thing I wanted was gelatinous ham all over my carefully ripped and worn flannel shirt. I unveiled my masterpiece on the bus ride that next morning. It got some chuckles out of my friends and a lot of weird stares from the rest of the crowd, so I was feeling pretty proud of myself. I decided the event called for a super-jump from the top of the bus steps, and I was in mid-freefall when it occurred to me that this was a stupid idea. As my feet hit the concrete, there was an audible click as the necklace pulled taut and the pop top ripped open. It was almost as if I’d pulled the pin on a hand grenade; everyone standing around took three big steps away from me. As luck and science would have it, gravity and inertia pulled the can outward, and its contents just splattered with a juicy thump on the pavement. The next can I bought weighed in at a more respectable 12 ounces, and I carried it around like a pet rock. I even made a leash for it. This can lasted for three weeks. Sometimes I’d sit it on the corner of my desk during class, and other times I rested it on my shoulder like a parrot. I was beginning to get a reputation for being “that Spam guy.” In the middle of that pet can’s third week, a cute skater girl sauntered up to me during advanced pottery class and started asking flirty questions. I was dying for the attention and summoned up as much wit and courage as possible. In the middle of explaining why I couldn’t decide on a name for the can, she pulled a potter’s knife out of her pocket and stabbed the living hell out of the Spam. I sat in disbelief, staring at the wet blade of the knife and her twisted, satisfied sneer. Into the trash it went, right alongside my ego. Undeterred, I soon moved on to Deviled Spam. I took cans of it everywhere I went because they were smaller and less prone to knife attacks. After graduating high school and getting a summer job at a grocery store, I used my first paycheck to buy a case of these tiny cans of Spam. I thought it would be hilarious to collect one for every day that I worked, thinking this was just a short-lived summer job. Ninety-odd cans and four months later, I stopped buying them. In 1996, during the sci-fi fantasy convention Dragon Con, I had one last run at the Spam joke that would never end. The gag had lasted for four-and-a-half years at this point and my friends were tired of it, but I’d kept pushing. I was running on two days with no food, stuck in the Atlanta Hilton with three of my closest friends and no money for meals. We were subsisting on complimentary corn chips and Kool-Aid from the Con suite, when I noticed a shiny new can of Spam on the table. I asked the volunteer manning the room who owned that can, and he just shrugged and said it was purchased as a joke and that no one was going to eat it. He said I could have it, and I immediately darted over to scoop it up. Famished, halfway delirious from a lack of protein and hopped up on way too much sugar water, I marched down to the dealers’ room/exhibitors’ hall – and over the course of the next five hours, I made it my mission to cover the can in pseudo-celebrity autographs. I got a bevy of comic book and fantasy artists to sign the can (Mark Bagley, John Bryne, Ken Meyer Jr., Bernie Wrightson, and Bo Hampton to name a few), as well as Darth Vader himself, convention legend David Prowse. In my mind, it was the coup de grace of my very long experiment in absurdist comedy. I was only made fun of twice and verbally abused once (by Jim Steranko, who let out a Christmas Story-like stream of profanities). The last guy to sign the can, Glen Danzig, was even a personal hero of mine, though the whole experience failed to even faze him (makes you wonder what he’s been asked to sign over the years.) I’m pretty sure it was at that point where I finally got tired of the whole thing. I guess you can take a joke too far … but I still have that last can. PreviousBecoming a Glyos System Addict! NextDigging deeper into the story of E.T.